If you have tried putting together the new flat-pack furniture and were left with something barely resembling the furniture in the showroom and a hand-full of space parts and screws, you need the help of the professionals. We have been assembling wardrobes, beds, tables and other flat-pack furniture from IKEA and other retail shops, always delivering great looking furniture. Our furniture assembly Putney SW15 services are performed by knowledgeable professionals. Our years of experience guarantee you will receive high quality customer services without breaking the bank. 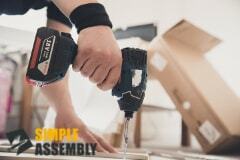 Simple Assembly is an established and recognisable company that has gained popularity among Londoners. That is because we believe in providing customised, flexible and efficient furniture assembly solutions at local competitive rates. Our company works with fully insured and qualified handy persons who deliver a timely service in the most professional manner. They are equipped with high-end power tools and have the experience to assemble your IKEA furniture with outstanding results. On that note, the furniture fitters in Putney will readily piece together your wardrobe, kitchen unit or office furniture made from any other popular brand. It is really easy to make a booking for our furniture assembly in Putney. Just call 020 3404 5905 at your convenience and a member of our customer care team will assist you promptly. You can also request your free quote or further information about our services by completing the online booking form or by using the live chat option.